This page follows the rebuilding of a brass SP “Pacific” type of locomotive. 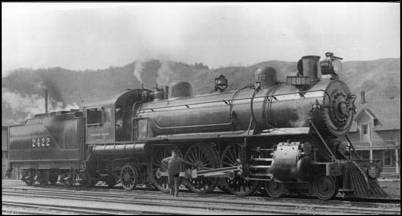 The P-1 was Southern Pacific’s first class of Pacific type locomotive. The prototypes were built between the years of 1904 and 1907. Most of the P-1 class was built by Baldwin Locomotive Works in Philadelphia. Over the years of service these locomotives saw extensive modifications and rebuilding. Several of the P-1 class locomotives were rebuilt into a larger P-4 class in the late 1920’s. The Westside model is representative of the early years of service prior to about 1917 when super heating was added. I decided that I would paint and detail the model to match the prototype number 2422 locomotive. The primary reason I chose number 2422 is that I found a pair of photos in reference material that showed both sides of prototype. The model is a very good match to the prototype in the 1914 time frame. The model is a brass Westside P-1 “Pacific” that was made by Mizuno Micro Cast and imported in 1974. I purchased the locomotive in essentially mint condition, the tender body was still wrapped in the original plastic, and the trucks had never been installed. The locomotive itself was in great shape other than a little tarnish from some fingerprints over the years. This model came with an open frame motor and a partially open brass gearbox. All of the moving parts were somewhat frozen up as the locomotive had never been lubricated and had been sitting in storage for almost thirty years. After a little oiling everything freed right up and the locomotive ran fair. The quartering was off on at least one wheel as it had a very pronounced lope. Even though the model was essentially new, the gearbox had a lot of slop in it and it ran very noisy. The gearbox quality was not very good as was typical of early brass models that were not made by KTM.